i Click 'view all' to instantly compare this good deal with offers on other top bed pillows king size. Classic Brands Cool Sleep Ventilated Gel Memory Foam Gusset Pillow King is currently selling at $39.99, approximately $0.09 lower than average, giving a potential saving of $1.41 right now. With a lowest price of $39.99 and an average of $40.08 it is selling on the low end of its usual range. Price volatility is 0.59% (meaning it does not change often), so the price should stay low for a while. Right now this product is a recommended 'good deal'. The current deal is also the best price on this item over the last month. 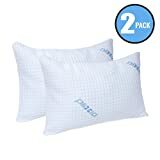 Compare the current price, savings (in dollars & percent) and Buy Ratings for the top Bed Pillows King Size that are closely related to Classic Brands Cool Sleep Ventilated Gel Memory Foam Gusset Pillow King. Here is how Classic Brands Cool Sleep Ventilated Gel Memory Foam Gusset Pillow King compares with other leading Bed Pillows King Size. Classic Brands Cool Sleep Ventilated Gel Memory Foam Gusseted Pillow is made of a unique material that infuses gel particles into memory foam, creating a plusher and more comfortable sleeping surface. The memory is responsive and cradles your head and provides support for your neck and shoulders. Cool sleep gel combined with a Cool-pass performance knit cover is specifically designed to regulate temperature and wick away moisture for a more comfortable night's sleep. 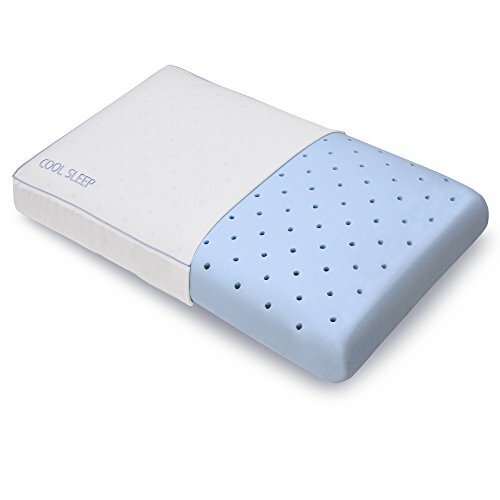 The Cool Sleep pillow features ventilated Gel Memory foam, which is a unique material that infuses gel particles into memory foam, creating a plusher and cooler sleeping material. In addition, the Cool Sleep Gel Foam Pillow responds to temperature and pressure to mold to your shape by creating the perfect support for your head, neck and shoulders. Gel memory foam is more porous or open than conventional foam meaning the cells are interconnected unlike closed cell foam; thereby is more breathable and comfortable than higher density visco-elastic foam. Benefits of Cool Gel Cool Gel keeps you cool while you sleep - the Cool Gel side disperses body heat and creates a cooler sleeping surface while working with the core of pressure-relieving memory foam. Its cooling properties dissipate heat for a comfortable night’s sleep. The Memory Foam side responds to temperature and pressure to mold to your shape by creating the perfect support for your head, neck and shoulders. Latest Open-Cell Memory Foam Technology Open Cell Memory Foam promotes airflow through the pillow - this next generation of memory foam is more porous or open than conventional foam meaning the cells are interconnected unlike closed cell foam; thereby is more breathable and comfortable than higher density visco-elastic foam. The open-celled physical structure of our foams is self-ventilating. Air travels throughout the material and actually dissipate body heat regulating your body temperature. Memory foam is naturally antimicrobial and resistant to allergens, mold, bacteria and dust mites. The Right Pillow Matters Choosing the right pillow is important. About 20% of your sleep surface is comprised of your pillow. You may not be sure of the right pillow, but you will definitely know when you have the wrong one. It is important to have a pillow which can contour to accommodate the natural curves of the neck to maintain the proper neck posture while sleeping. Whether you sleep on your side or back, your pillow must be soft enough to mold to your head and still fill in the space between your bed and your neck. You need to support both, since your head is larger than your neck and our gel memory foam pillow is great for this. This pillow will support the head at the proper height whether you are sleeping on your back or on your side, keep your head tilted in the proper position while sleeping on your back and provide neck and upper back support when sleeping on your back. Easy Cleaning This pillow comes with a removable zip-off machine washable cover. Quality Assurance Classic Brands Cool Sleep Ventilated Gel Memory Foam Gusseted Pillow is backed with a 5-year worry-free warranty.